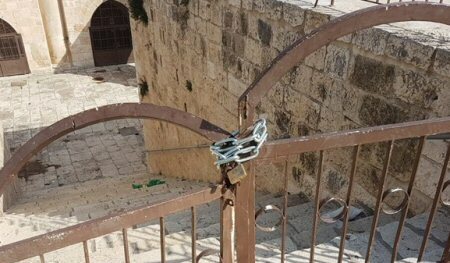 Israeli forces resealed the Al-Rahma Gate of the Al-Aqsa Mosque with a lock and chain, after a group of Palestinian youth were able to break the lock and open the gate for worshipers, on Monday. A Ma’an reporter present at the scene said that confrontations erupted after Israeli forces resealed the gate. Soldiers assaulted Palestinian worshipers and students of Sharia school, detaining and assaulting five Palestinians, including a woman. They then sealed off all gates of the mosque compound and prevented worshipers from entering. Meanwhile, dozens of Israeli settlers raided the compound via the Moroccan Gate, under armed security of Israeli forces. Israeli police forces had sealed off the gate with locks and iron chains, on Sunday.